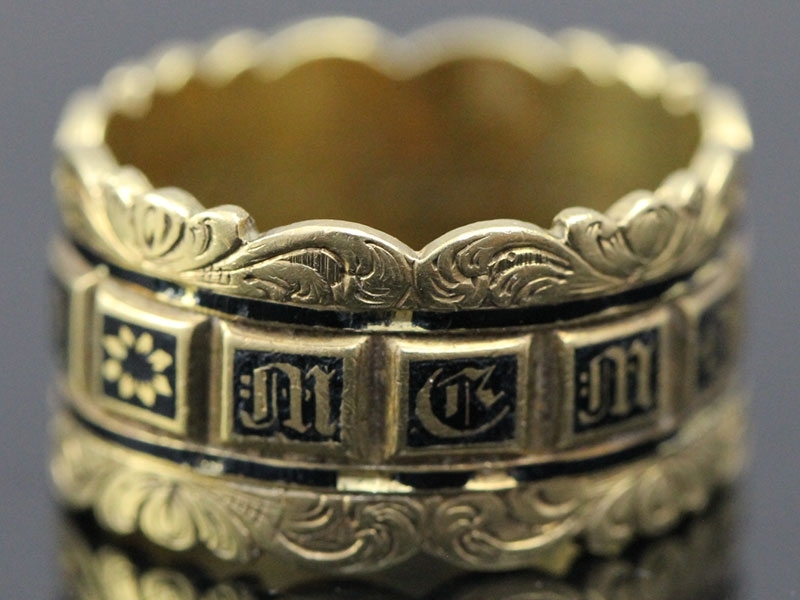 This Mourning ring is so fascinating and boasts fabulous workmanship. 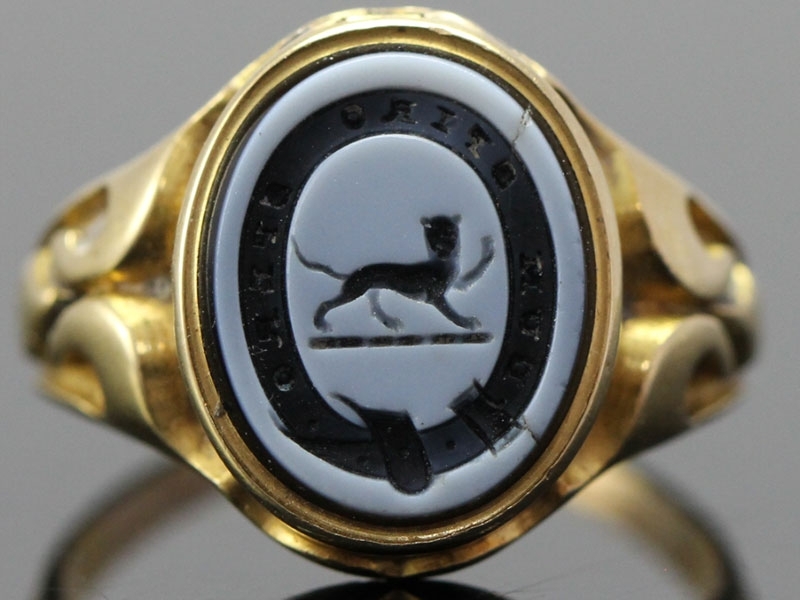 This ring dates 1859 and has a young Victorian head within the hallmark. The ring contains 15 sparkling old cut rose Diamonds set within a cross design enveloped in black enamel and beautiful edged Gold engraving. 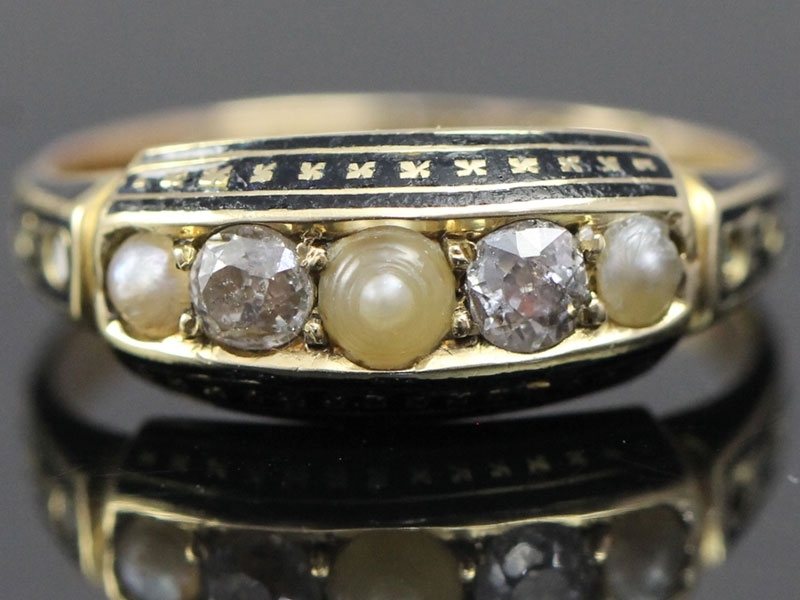 This is a beautiful old mourning Ring steeped in English History. 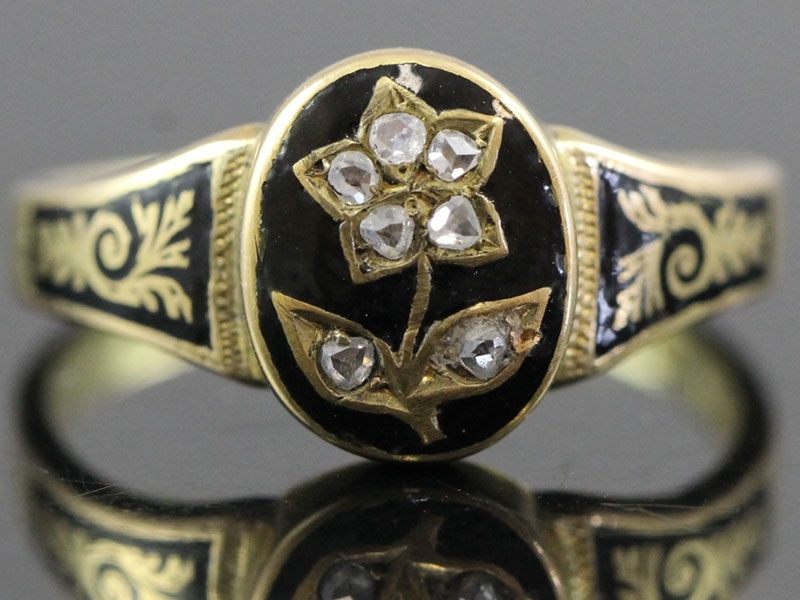 A Victorian 18 carat Gold mourning ring of flat band section, the obverse is decorated with beautiful windows of detailing with bands of black enamel and hatched engraved Gold work. 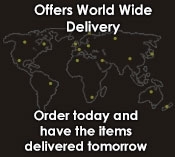 The central black Enamel band bears beautiful detailed symbols. 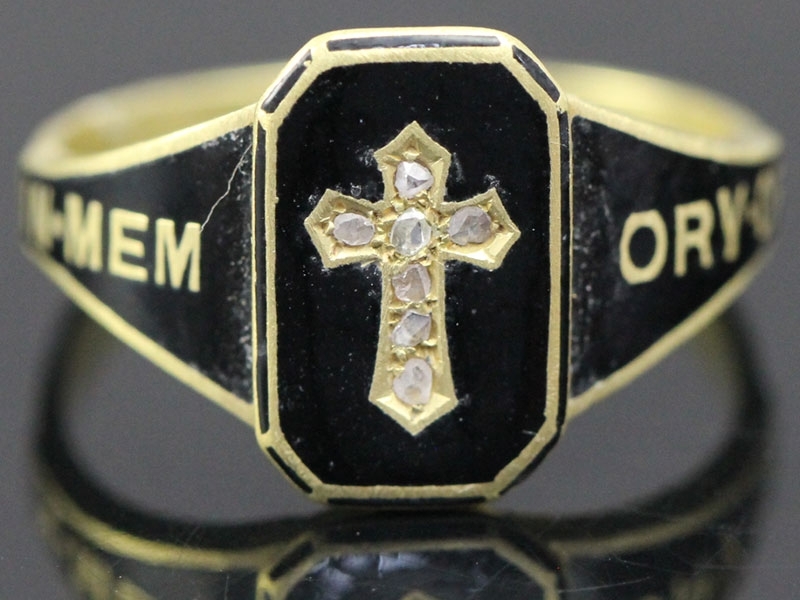 Stunning Victorian mourning ring. No one mourned quite like the Victorians who commissioned tokens and mementos to remember their closest loved ones. This ring has been beautifully crafted in 18 carat yellow Gold. Set into this ring are seven old rose cut Diamonds, sparkling out from within a yellow Gold carved cross. 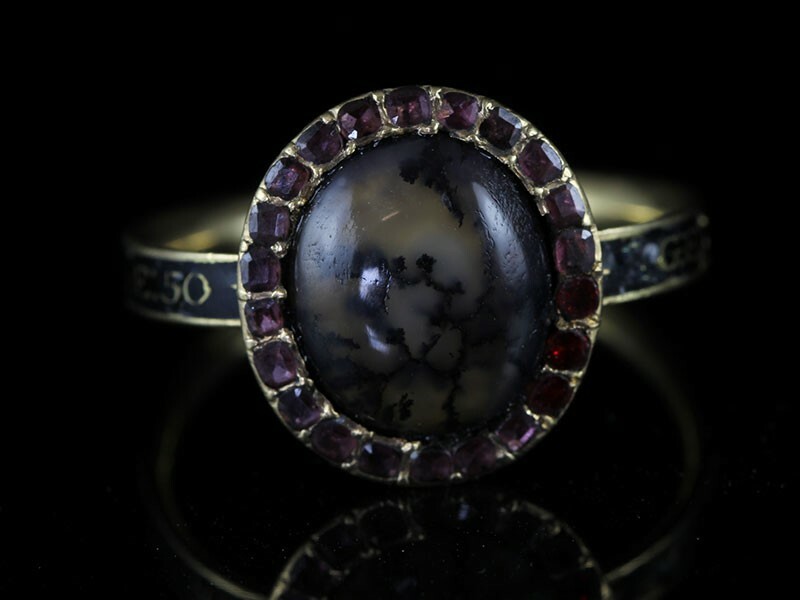 This very special ring is Georgian, dated 1771. While the art of mourning is a field unto itself, and many examples are similar, coming across one that is an especially beautiful example is always exciting. Mourning jewellery mirrored the lives and times of the people who wore it. 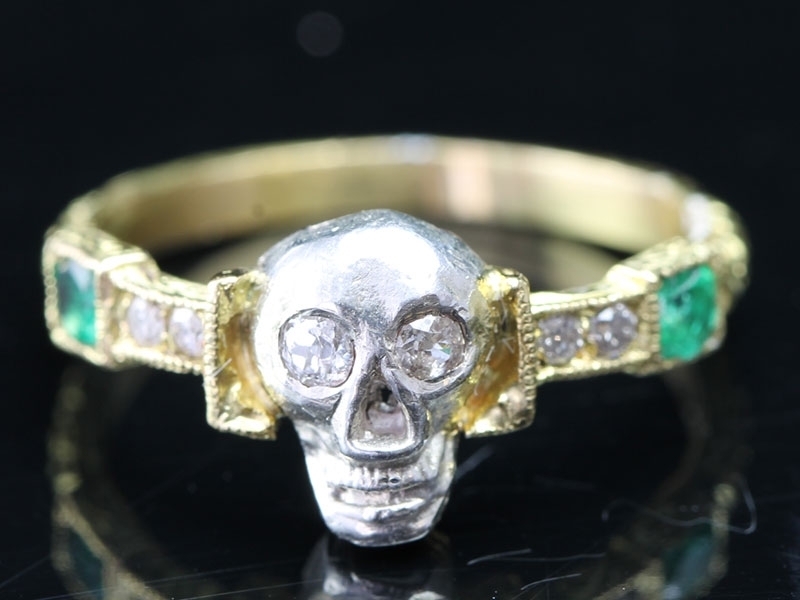 It was a souvenir to remember a loved one, a reminder to the living of the inevitability of death, and a status symbol, especially during the Victorian era. 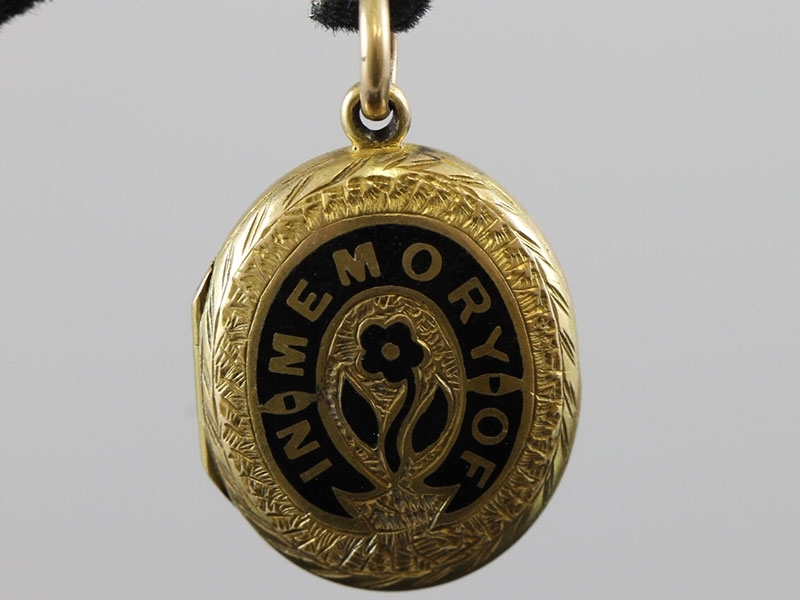 Victorian, Circa 1890 Victorian 15 carat Gold oval mourning locket with ''In Memory Of'' on black enamel to the front, with an upside down tourch wrapped by a gold sash with black enamalling wording: "IN MEMEORY OF"
This very special ring morning ring. While the art of mourning is a field unto itself coming across one that is an especially beautiful example is always exciting. 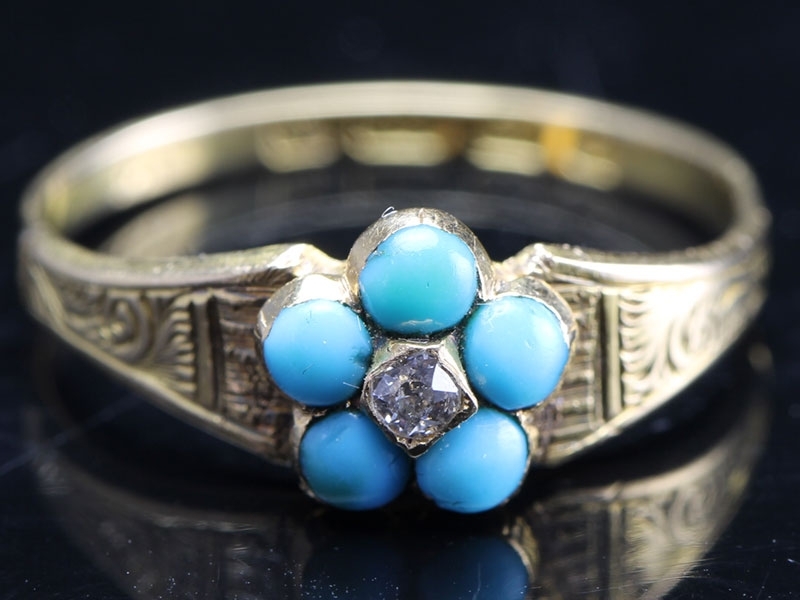 A fabulous Victorian forget-me-not flower ring! Dates 1899. A truly very special piece. 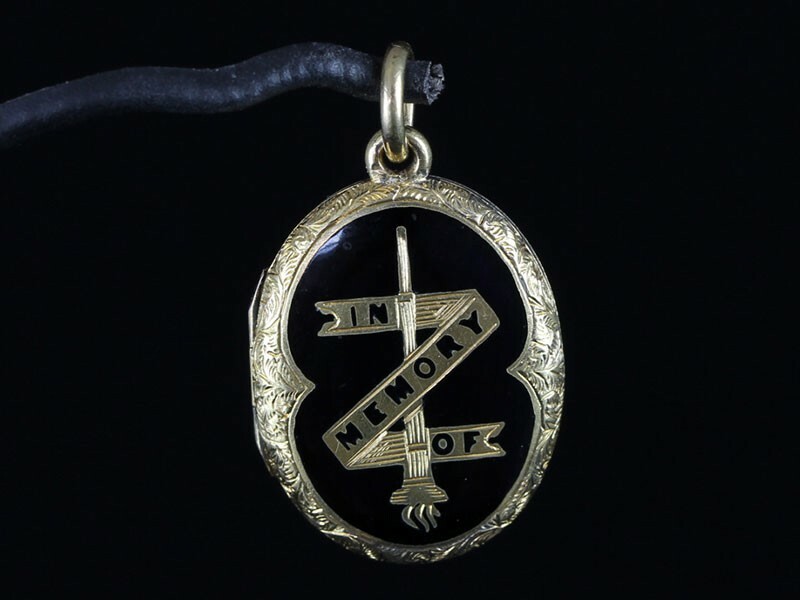 Victorian, Dates: 1890 - Victorian Gold oval mourning locket with ''In Memory Of'' on black enamel to the front, within a Gold hand engraved halo design. 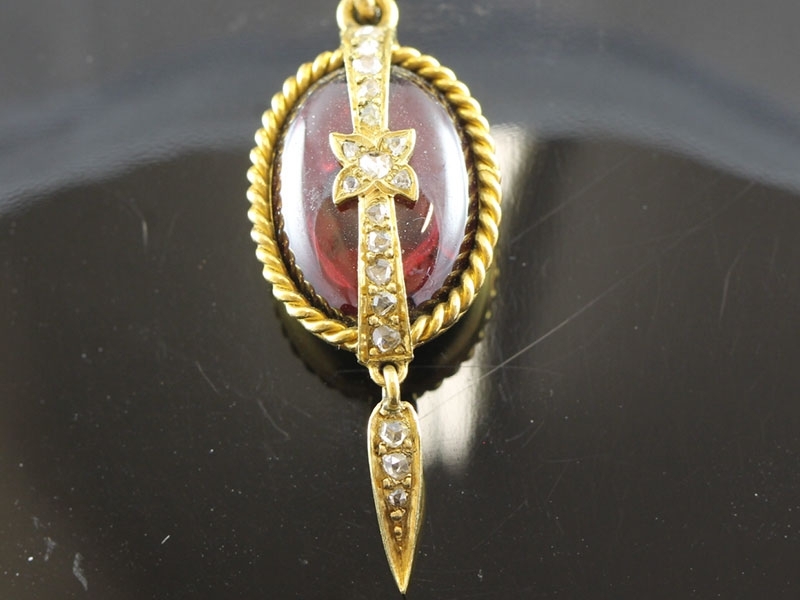 A magnificently ornamented oval Bohemian Garnet overlaid with a sparkling Diamond set star and band. To die for! 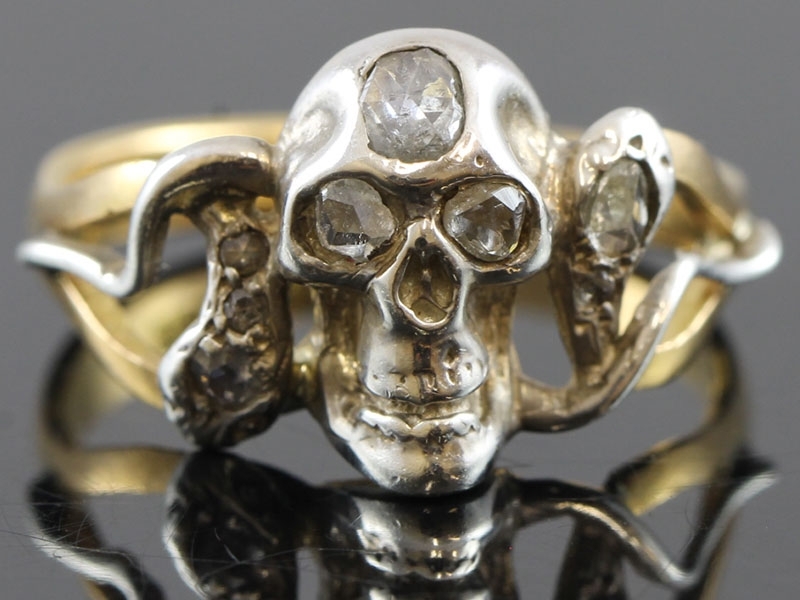 This fabulous 22 carat yellow Gold/Silver Memento Mori Diamond Skull & Snake ring is stunning. There is no denying that this ring is so beautiful and was a wonderful reminder of a loved one passing. 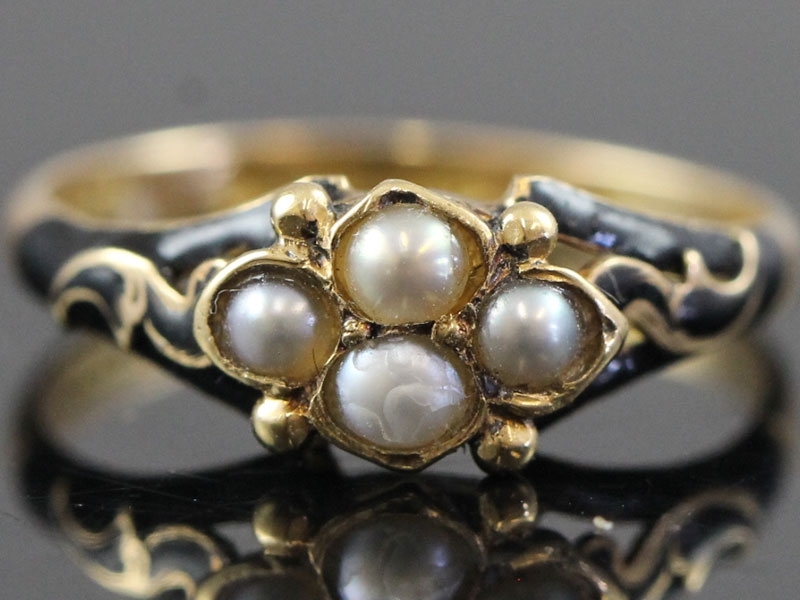 A lovely black enamel and natural seed Pearl 18 carat Gold Edwardian ring, steeped in English history. 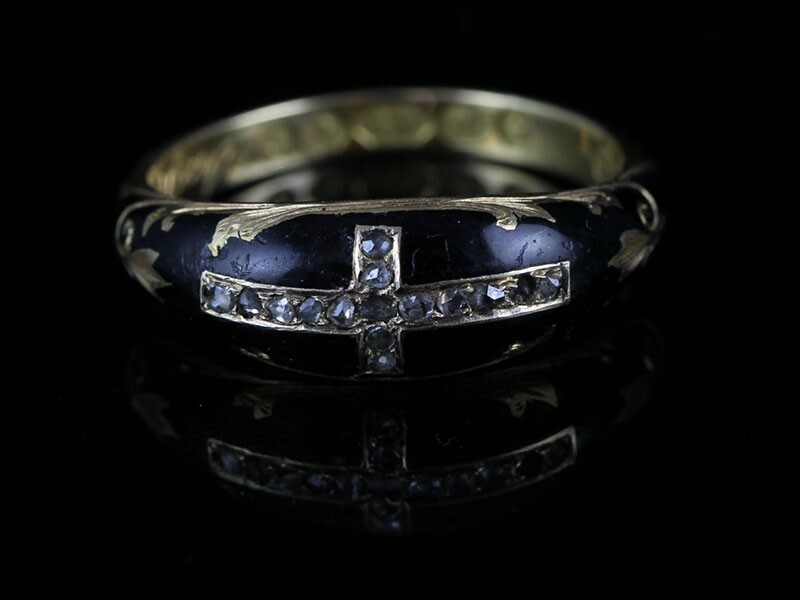 A fabulous antique Victorian 15 carat Gold Pearl and Diamond black enamel mourning ring, Dates 1868.